The Wethersfield native was brought into this year’s class with the likes of Leszek Wrona, Paul Toomey, Michael Noonan, Richard Eddy, Mark Holowesko and Kyle Martino. All seven inductees shared great admiration and respect for each other. “Now that he’s gone on to coaching, he’s done a terrific job at Farmington High School,” said Eddy, who has 29 years of certified soccer refereeing under his belt. Waters and Holowesko also share a connection deeper then both being named to the hall of fame this year. “”I knew Steve Waters as a player when I was president of the Wethersfield Soccer Club,” Holowesko said during his speech. Waters played at Wethersfield High School from 1973-76, and helped the Eagles win a State Championship in 1975. “My Wethersfield teammates taught me to play to compete, not just play to play,” Waters said. He moved on from WHS and continued to build his talents playing at the University of Hartford. Waters had an impressive collegiate career, named to the All New England teams in both ’78 and ’79. In his transition from player to coach, Waters kept up his winning ways, earning three NHSACA Regional Coach of the Year awards while coaching at FHS. 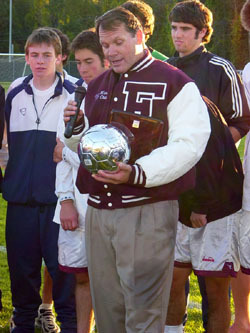 He was also named the CT Soccer Coaches Association Coach of the Year in 2001.